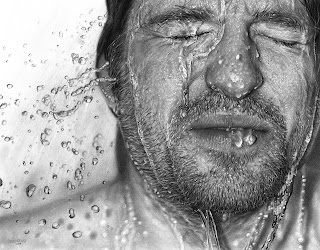 The work of Hyperrealists is so lifelike that a pencil drawing resembles a black and white photograph. The results can be so eerily realistic that every feature is drawn or painted in photographic precision at mind-blowing resolutions that could have been produced by any high-end professional camera. With his enthusiastic students busy scratching away with their pencils against white sheets of paper during a drawing class, this writer’s art lecturer, the late Daliso Mwale once said: “if you can draw as good as a camera (photograph) you might as well stop”. In shorter terms, Mwale was probably saying, “what’s the point”? But Dirk Dzimirsky, a German Hyperrealist does not agree at all. Dzimirsky a 44-year-old who has been drawing all his life but had not really considered becoming an artist. He was initially interested in music but discovered his real talent lies in art. It was not until 2005 however, that he took up a career in art, at age 35. Completely self-taught, he decided to become a hyperrealist and has never looked back since. “I grew up in the 1980s and the art in Germany back then was absolutely nothing that would inspire me to become an artist myself. I got a real bad opinion about art at that time. By doing realistic art I always felt outside but today I do not care and just do what I like. Luckily I am not limited to Europe with my art,” he says. Although he believes his type of art is also quite technical, he declares an artist’s work must have feeling and personality. Like in music, he says, when you play a music piece on an instrument and it sounds like a technical exercise because it is too stiff and all notes are played with the same loudness, it becomes boring. He says it is only when you add imperfections like varying the loudness of notes and changes to the tempo then you add feeling and you actually start making music and that this is true with art. For him it still has to be recognisable, realistic art but with small imperfections in the right places he adds ‘music’ to his work. Other than likening his technique to that of a musician, he also compares himself to a detailed writer, to him; every tonal shade of a pencil or paint is set right where it is supposed to be, similar to a paragraph, coma or full stop in the work of an essayist or biographer. “The sum of all my pencil lines or brush strokes describes a person. By adding a stroke there or a pencil mark here I feel like describing aspects of a person and even about the character. But at times I also feel like I am actually not very patient but just very talkative with pencils and brushes,” he explains. Speaking of lacking patience, he describes how sometimes as an artist it can become quite risky when one becomes irritable during the course of work as one may end up ruining, hours, weeks or in his case months of work by a simple smudge of the pencil. Dzimirsky as well as any other serious artist or purist does not believe in using an eraser. In fact to the unenlightened, it would be interesting for you to learn that in accademic circles erasers are not allowed in art class. “A drawing or a painting can be like a diva. You are trying so hard to do anything to please her but she is never satisfied. But I have not really ruined works before. Unlike most hyperrealists I do not work my way down from the top left corner to the bottom right and I do not consider every part of a work as equally important as every other part,” says the artist who uses photographs as references but is never after a perfect reproduction only using them very loosely once he establishes the proportions. He explains that the brain is trained to differentiate between important and less important information. We see so many photos every day that we are only briefly glancing at them. When you draw or paint in the hyperrealist style you still abstract and simplify very much as you never can make an exact copy of a photo. That is why, he believes, people often say “Wow” when viewing hyperrealist work, because it is kind of refreshing for the brain. With regards technique and theme, he is predominantly a portrait artist, but water as a thematic subject is a recurring element in his works. Two good examples of such work are Drawn Face VI, (2009) and the more recent Melting Ice Crown, (2012). Both depict the close-ups of faces with intense expressions, the first a lightly bearded man with water splashed across his face, the second a young girl with water cascading down her face. Both subjects have their eyes closed yet feel so alive by their expressions. While the two works are not in colour, the picture of the girl is actually a monochrome painting, which is painted in such a way that it resembles pencil, the medium used on the male subject. He says that creating work that is so realistic does have its downside, because every now and then people would say his work cannot be real and he probably uses some form of trickery, but the does not bother him. 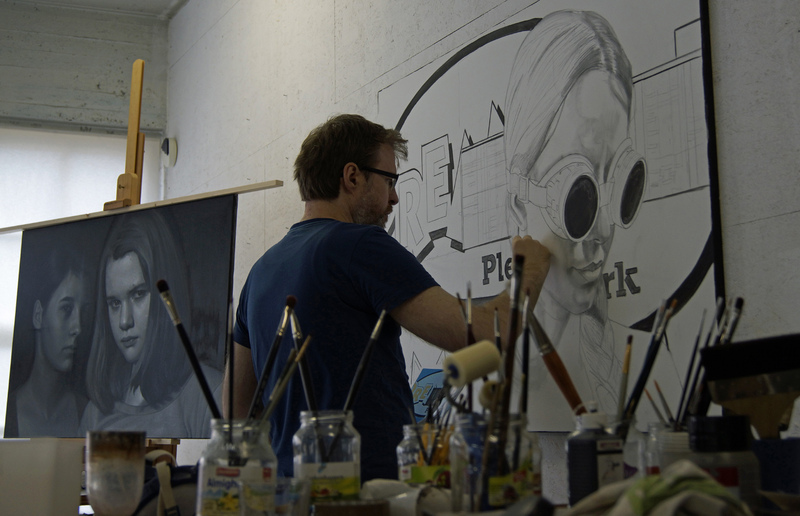 He acknowledges that there are a lot of artists cheating on the internet, so he understands why people get suspicious. But he publicly exhibits his works and people can confirm that they are not photographs. When he took up art professionally, focused almost only on drawing which he describes as his first love but since last year he has taken up painting and evidently, his paintings are just as hyper realistic as his drawings as can be seen in a recent work entitled Used Truth (oil on canvas, 2013), the spellbinding portrait of a young lady holding a watering can. She is dripping with beads of water and is executed in photographic precision down to the last eyelash and strand of hair. The black background and play on light and shadow enhance the image’s realistic appearance. 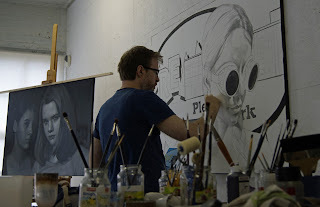 Professionally, Dzimirsky is not attached to any particular gallery and prefers to go about the comercial aspect of art by himself, although he does conduct drawing workshops for a limited period within the year. He has exhibted extensively in the USA, the UK and Germany at Principle Gallery, Alexandria, USA, Courtauld Institute of Art , London, UK, Stadt Hamminkeln, Germany , Williams & Co Gallery, New York, USA - Aqua Art Miami, USA and the Blackheath Gallery, London. Nevertheless, as much as the works of Dzimirsky are a welcome and refreshing shift from the sometimes infuriating conceptual art that appears to be consuming the style of every artist in its path, Hyperrealism can also serve as a reminder of what the hand can do without the aid of the technology we are so inclined to nowadays, a reminder that without the aid of high-tech gadgetry the artist’s human cognizance still has delicate powers of observation, hyperrealism is a celebration of being human. Dirk is a master and his work will survive. People, decades from now will stil stand in awe and still ask, "how did he do this"? Thank you, Dirk, for sharing your talent and your passion. Hi not meaning to be rude but the first pencil drawing is by a scottish artist named Paul cadden it would be good if you would give him credit for his drawing thanks. Kolkata escorts Pleasant review and I basically love understanding it. The substance said is watchful and right. I just got the thing which I was seeking after down coming to fruition to experiencing this blog. Principal, basically especially amazing data. Kolkata escorts have given me a respectable learning data and I truly esteemed it an amazing measure.